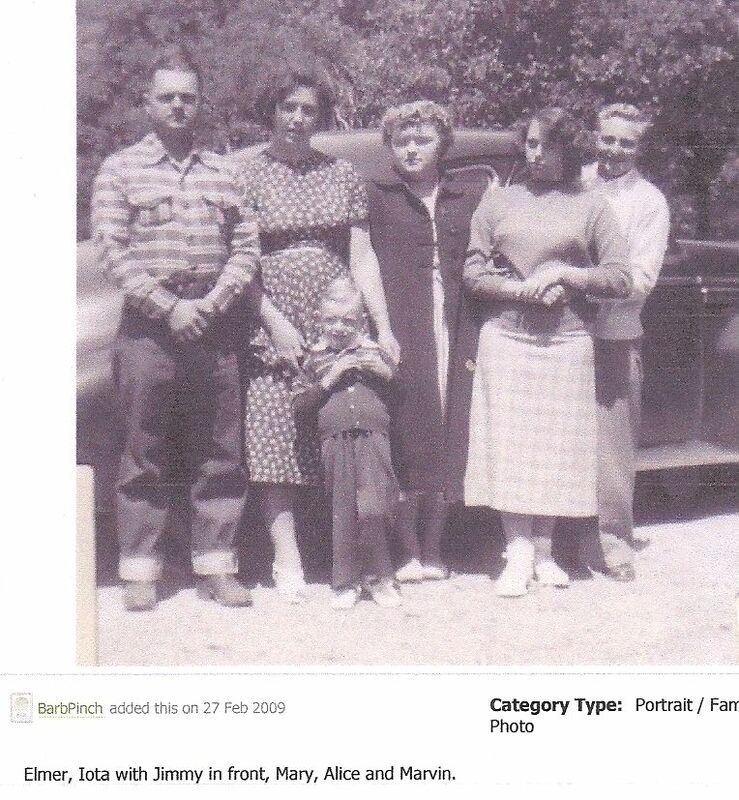 James Elmer JACKSON [Parents] was born on 29 Jan 1914 in Blackfork, Scott, Arkansas. He died on 26 Jan 1963 in St. Helena, Napa, California. James married Thelma Iota COLLIER on 16 Jun 1931 in Eureka, Humboldt, California. Thelma Iota COLLIER [Parents] was born on 18 Aug 1915 in Purcell, McClain, Texas. She died on 25 Jun 1963 in St. Helena, Napa, California from Complications from gangrene and blood clot. She was buried in St. Helena Public Cemetery, Napa, California. Thelma married James Elmer JACKSON on 16 Jun 1931 in Eureka, Humboldt, California. F i Mary Louise JACKSON was born on 25 Jan 1932. She died on 30 Mar 1989. F ii Alice Marie JACKSON was born on 20 Jul 1934. She died on 26 Oct 2006. James Elmer "Jimmy" JACKSON was born on 12 Dec 1942 in Fredricksberg, , California. John Nathan COLE was born on 26 Sep 1850 in , , Kentucky. He died on 4 Aug 1926 in Keota, Cimarron, Oklahoma. John married Weltha JONES on 6 Jul 1871 in , Cass, Texas. Weltha JONES [Parents] was born in 1855 in , Cass, Texas. She died on 27 Jan 1932 in , Haskell, Oklahoma. Weltha married John Nathan COLE on 6 Jul 1871 in , Cass, Texas. James T. JONES [Parents] was born on 16 May 1863 in , Cass, Texas. He died on 23 Dec 1929 in Redland, McCurtain, Oklahoma. James married Glenda Dora PHILLIPS in 1890. Glenda Dora PHILLIPS was born on 21 Aug 1871 in , , Mississippi. She died on 24 May 1901 in , Haskell, Oklahoma. Glenda married James T. JONES in 1890. Ada Lee JONES was born on 11 Feb 1891 in Indian Territory, , Oklahoma. She died on 27 May 1950 in Idabell, McCurtain, Oklahoma. F ii Nancy Mae JONES was born on 25 Jan 1894. She died on 31 Jan 1974. Tandy JONES was born on 21 Jan 1896 in Indian Territory, Redland, Sequoyah, Oklahoma. He died on 2 Apr 1975 in Idabell, McCurtain, Oklahoma. Claud Henry JONES was born on 6 Apr 1898 in Indian Territory, Stigler, Haskell, Oklahoma. He died on 27 Jul 1967 in Idabell, McCurtain, Oklahoma. Neely Anderson "Harve" OWENS was born on 25 Oct 1874 in Breckenridge, , Texas. He died on 7 Aug 1944 in Ada, Pontotoc, Oklahoma. Neely married Mollie UNDERWOOD. Mollie UNDERWOOD was born in 1873 in Indian Territory, Oklahoma. She died on 7 Sep 1963 in Ada, Pontotoc, Oklahoma. Mollie married Neely Anderson "Harve" OWENS. F i Emma Mae OWENS was born on 28 Sep 1910. She died on 4 Oct 1993. Marvin JOHNSON was born on 24 Jun 1910. Marvin married Emma Mae OWENS. Emma Mae OWENS [Parents] was born on 28 Sep 1910 in Stonewall, Pontotoc, Oklahoma. She died on 4 Oct 1993 in Ada, Pontotoc, Oklahoma. Emma married Marvin JOHNSON. Albert CORN [Parents] was born on 23 Jul 1923. Albert married Jeanette. Jeanette. Jeanette married Albert CORN. John Martin JONES [Parents] was born on 15 May 1845 in Saltillo, Hardin, Tennessee. He died on 15 Oct 1926 in Louann, Quachita, Arkansas. John married Sarah Rebecca MCGEE. Sarah Rebecca MCGEE was born on 16 Aug 1855 in , , Texas. She died on 22 Mar 1928. She was buried in Guerdy Cemetery. Sarah married John Martin JONES. F i Aspie Ann JONES was born on 26 Jun 1885. She died on 3 Mar 1968. William Edward WATSON was born in 1874 in , Weakley, Tennessee. He died in 1950. He was buried in Guerdy Cemetery. William married Aspie Ann JONES. Aspie Ann JONES [Parents] was born on 26 Jun 1885 in Saratoga, Mardin, Texas. She died on 3 Mar 1968. She was buried in Guerdy Cemetery. Aspie married William Edward WATSON. Peter Ogan PRUETT was born on 16 Mar 1840 in Hancock, Tennessee. He died in 13 Dec 1908 or 8 Nov 1909 in Borden, Texas or Oklahoma. He was buried in , , Oklahoma. Peter married Mary Ann TOWSEND. Mary Ann TOWSEND was born in 1849 in , , Tennessee. She died after 1918. Mary married Peter Ogan PRUETT. Robert Davie BUMPASS was born on 10 Jul 1797 in , Person, North Carolina. He died on 30 Jan 1879 in Farmersville, Collin, Texas. Robert married Nancy Marietta DAVIE in 1821 in , Person, North Carolina. Nancy Marietta DAVIE [Parents] was born on 15 Aug 1803 in , Person, North Carolina. She died on 14 Sep 1873 in Farmersville, Collin, Texas. Nancy married Robert Davie BUMPASS in 1821 in , Person, North Carolina. M i James Carroll BUMPASS was born on 25 Aug 1826. He died on 16 Jan 1903. M ii John Kendall BUMPASS was born on 18 Dec 1829. He died on 9 Aug 1899. F iii Margaret Aramynta BUMPASS was born about 1830. She died in 1902. Elizabeth C. "Betty" BUMPASS was born on 30 Sep 1832 in , Person, North Carolina. She died in 1862. M v Robert Presley BUMPASS was born on 10 Oct 1833. He died on 25 May 1864 from Civil War. William Ambrose BUMPASS was born in 1834 in , Person, North Carolina. He died in 1887 in , Collin, Texas. F vii Nancy Adams "Nannie" BUMPASS was born on 10 Nov 1838. She died on 20 Jul 1900. Alexander Jones BUMPASS was born in Feb 1841 in , , North Carolina. He died on 25 Mar 1865 in Petersburg, Dinwiddie, Virginia. M ix Thomas Haliburton BUMPASS was born on 10 Feb 1843. He died on 8 Mar 1893. M x Horace Linsey BUMPASS was born on 11 Oct 1845. He died on 11 Sep 1880. "Polly" BUMPASS was born in 1848 in Mill Creek, Person, North Carolina.